The resolution in favor of American intervention in Syria conceals an agenda for escalation far beyond, as a statement by Senate Foreign Relations Committee Chair Robert Menendez described it, a “narrow” and “focused” US response to the chemical weapons attack on August 21. The American public and Congress are being fooled into a broader effort that looks a lot like war and regime change. Maybe it’s the price the president paid for Senator John McCain’s vote. But McCain’s amendment, which says, “It is the policy of the United States to change the momentum on the battlefield in Syria as to create favorable conditions for a negotiated settlement,” suggests escalation will not be far behind airstrikes. The measure authorizes: two or three months of sustained bombing and missile strikes, aimed at decisively damaging Assad’s military bases and infrastructure; increasing the capabilities of the insurgent forces—somehow without strengthening Al Qaeda—and profoundly weakening Assad’s capacity to continue in power. The prohibition of boots on the ground, so important to Congress, does not cover CIA boots on the ground, nor the boots of American advisers and trainers just over the Syrian border. The parallel with Iraq is crystal clear. That earlier war was based on false information about “weapons of mass destruction” in the terrifying hands of Saddam Hussein. In an interview, Iraq war architect Paul Wolfowitz said that the nonexistent weapons were the best argument for mobilizing public opinion and a reluctant Congress. In this war, there seems to be no question that a sarin-type gas attack killed over 1,000 people, although a UN investigation is incomplete and there are questions about who exactly ordered the attack. That major difference aside, the eerie parallel with Iraq is that the chemical weapons attack is a pretext for expanding the American war in Syria on a much broader basis than is acknowledged. The American public deserves a full explanation for what we are expected to support. Perhaps regime change is a good idea. But then why not make the argument openly? There can be only one very familiar reason: that if the American people and Congress heard what the war-makers have in store, there would be little chance of approving the marching orders. If public currently opposes the missile strikes, imagine the reaction toward an even wider war. The authorization would be dead on arrival. No one knows what the outcome in Congress will be. But it’s hard to imagine Democrats embracing McCain’s version of Obama’s bill, when it’s already difficult for them to support the president’s narrower original goal. And it’s equally hard to see House Republicans supporting John McCain over Senators Rand Paul and Marco Rubio, who voted no in the Senate committee. The combination of Obama and McCain together could be far too much for the Tea Party to swallow. The first casualty in politics and war, it turns out, is the truth. Before too many days pass, the true scale of the proposed escalation should be revealed and debated. That’s what the war-makers, in their haste, may fear the most. 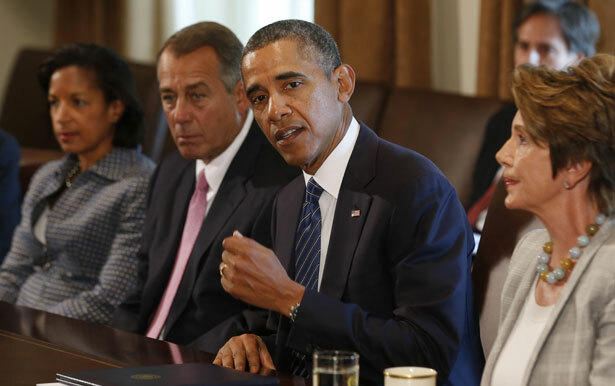 Could Obama go to war without Congress’s approval? Zoë Carpenter reports.